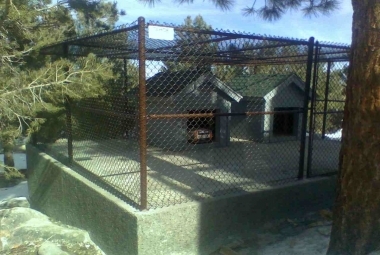 Tahoe Fence – Tahoe Fence Co., Inc. is your complete, full-service fence contractor capable of repairs, new installations, rental fencing and material sales. 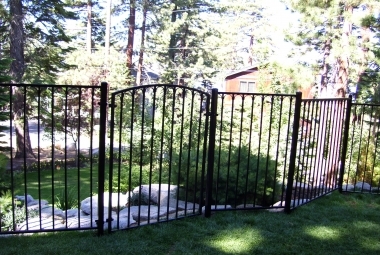 Tahoe Fence Co., Inc. has been serving the Lake Tahoe area, Northern Nevada, and Eastern Sierras since 1974. From the mountains through the valleys, we continue a tradition of excellence. We are a complete, full-service fence contractor capable of repairs, new installations, rental fencing/construction panels, and material sales. Our foremen are competent with wire, metal, wood, ornamental iron (steel), and vinyl fencing. Tahoe Fence Co., Inc. is large enough to meet all of your fencing needs, whether they are residential, commercial, or industrial. Yet, we are small enough to provide you the personalized service you expect. Tahoe Fence has been voted one of the Top 3 Fence Companies by the “‘Nevada Appeal’ Readers’ Choice Awards,” every year since 2009. Feel free to browse our website and contact us. Call toll free at 1-800-332-2822 or (775) 882-1063. And either use this site’s contact form or mail us at the address below. We would be happy to come out and give you a free estimate. Tahoe Fence stocks a wide variety of wire materials for you to select from, including: barbed wire, field fence, nonclimb, weld wire, galvanized chain link, and vinyl coated chain link. Most of these we can install on either metal or wood framing. The vast majority of wood materials Tahoe Fence sells, repairs, and installs are untreated redwood and cedar. We stock pressure treated wood and lodge pole as well. While most of our wood fences are built on wood posts (such as 4x4s, 4x6s, 6x6s, and 8x8s), it is possible to construct most styles on metal posts. Whichever you choose, posts on solid wood fences are almost always concreted in the ground. Add value to the look of your property with one of our ornamental iron fences. 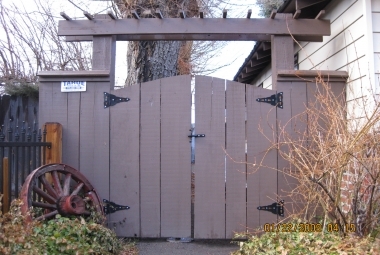 Tahoe Fence sells, repairs, and installs many styles from the simple to the elegant.